Henry Hutchings. Courtesy of the Library of Congress. Image available on the Internet and included in accordance with Title 17 U.S.C. Section 107. Grave of Henry Hutchings. Image available on the Internet and included in accordance with Title 17 U.S.C. Section 107. HUTCHINGS, HENRY (1865–1939). Henry Hutchings, soldier, publisher, and politician, was born in Somerset, England, on August 17, 1865. He was brought to America by his parents in 1866. He became a private in the Iowa National Guard in 1882 and, after moving to Texas, joined the Texas National Guard in 1885. In 1890 he founded and published the Austin Evening News and, for a time, published the Austin Statesman (see AUSTIN AMERICAN-STATESMAN). 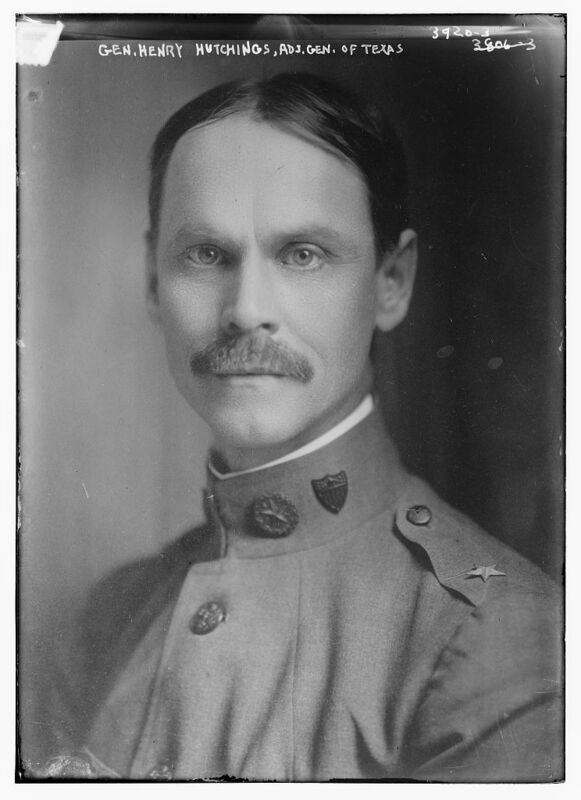 He was adjutant general of Texas from 1911 to 1917, when he resigned to organize the Seventy-first Infantry Brigade; he commanded this brigade in the United States Army overseas during World War I. He was secretary of state under Governor Pat M. Neff in 1925. From January 18, 1933, to January 15, 1935, he served again as adjutant general. Hutchings married Wittie Brown in 1886. They had seven children. On March 9, 1935, he married Mrs. Hallie White of Dallas. He was a vestryman at St. David's Episcopalian Church in Austin for twenty years. He died at his home in Austin on July 27, 1939, survived by his widow and six children. At the time of his death he was executive officer in charge of the narcotics division of the Texas Department of Public Safety. He is buried in the Texas State Cemetery in Austin. Austin American, July 29, 1939. Austin Statesman, July 29, 1939. Handbook of Texas Online, Lura N. Rouse, "HUTCHINGS, HENRY," accessed April 21, 2019, http://www.tshaonline.org/handbook/online/articles/fhu49. Uploaded on June 15, 2010. Modified on February 15, 2018. Published by the Texas State Historical Association.